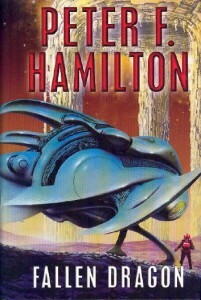 Hamilton's follow-up to the “Night's Dawn Trilogy” was another space opera, although this time not set in the same universe. “Fallen Dragon” is again set several centuries in the future. Humanity has discovered faster-than-light travel and has established a number of new colonies. Unlike the “Night's Dawn” universe, these colony efforts have not been too successful. Although most of the colonies are flourishing, there is insufficient potential for interstellar trade to allow their founding companies to recoup their massive investment. Hence, no more colonies are being founded and the existing colonies are largely ignored. The corporations that now control Earth do see some potential for profit from the colonies – a process they euphemistically call Asset Realisation. A fleet of starships is sent to a colony, upon arrival they requisition the colony's most valuable technical supplies and produce – rationalising this theft with the explanation that it is merely a partial payment for the debts incurred in founding the colony. If the colony refuses to hand over it's produce, then the corporation will use force to take it – using Earth's unrivalled military might to easily force the colony into submission. The main character is Lawrence Newton, a young man who emigrated to Earth from a colony planet after being betrayed by his father and the girl he loved. Upon arrival he enlists in the private army of one of the corporations, quickly becoming a veteran of the asset realisation missions. His most recent mission involves revisiting a planet he first went to over a decade ago. Although the colony outwardly bows down to the corporation, an underground resistance quickly makes life difficult for the occupiers with a cunning campaign of violence that doesn't allow the off-worlders any opportunity to identify the culprits. Newton, now a low-ranking officer, has to keep safe his young platoon from the partisans, while simultaneously trying to find an opportunity to return to a remote rural community he stayed in on his last visit. In the time since leaving the planet previously, Lawrence has realised that something very odd, and potentially highly profitable, is in that community – something that may have a relationship to the strangely highly-advanced technology the Resistance is using. The novel focuses primarily on events during the occupation of the planet, principally seen from the points of view of either Lawrence, or the female leader of a rebel cell. There are also extensive flashbacks to Lawrence's previous experiences on his homeworld, Earth, and some (occasionally disastrous) past asset-realisation missions. The premise is reasonably original, although not always entirely convincing. In particular, the motives of the rebel group seem a bit confused – their hostility to the corporation is easily justified but their other priorities seem a poor excuse for the violence that is needed to achieve those goals. It is also a bit difficult to reconcile Newton's pleasant personality, with the unquestionably immoral behaviour of the corporations he works for, and it is difficult to see why he does the job he does. Presumably Hamilton is aiming to make a comment on the dangers of corporate culture, but he seems also to try and find some sympathy for Lawrence and his platoon. The ending is also a disappointment, it has too little relevance to much of the book, and it feels rather contrived. Despite some major plot issues, there are plenty of nice scenes in this book. A disastrous Asset Realisation mission to a planet whose inhabitants have been experimenting with radical genetic engineering is a particularly good sub-plot. The rebel's efforts to defeat the corporation allows a number of good action scenes and cunning plots, it's just a pity that by the ending Hamilton has got distracted from this storyline. Although it can be difficult to empathise with the decisions some of the characters make, they are generally quite likeable despite this and the lack of any pure heroes or villains adds some depth to the story. Overall, “Fallen Dragon” is reasonably well written, but the plot is disappointing. It has potential but Hamilton fails to take advantage of this, with some questionable decisions about the direction of the story.